During these baseball-less months, the New York Mets have gotten a major makeover. With the free agent signings of Pedro Martinez and Carlos Beltran and a new head coach in Willie Randolph, the Mets look once again to be Amazin'. Another new face to Shea Stadium is a young player by the name of David Wright. But David is not just any newcomer. This top prospect did not disappoint last year when he got the call and belted 14 home runs with a .293 batting average in just 69 games. And the Mets have reason to be thrilled, as many experts believe Wright could be the next superstar third baseman of the Major Leagues. Last week, David Wright got the opportunity to take a special field trip to The Topps Company in the Big Apple. David not only signed cards for the upcoming 2005 Topps Cracker Jack, but he got to select photos of himself for upcoming Topps releases. TOPPS: What is it that you like about this particular photo you've selected? WRIGHT: I like the defensive look and the action captured in the shot. I also like the angle. TOPPS: What was your reaction when you saw your Bowman rookie card for the first time? WRIGHT: It was one of the coolest things to see myself on a baseball card for the first time. TOPPS: Did you collect Topps cards growing up? What player or players did you collect? WRIGHT: Yes, I collected Topps. I grew up a Mets fan. Me and my dad collected all the New York Mets especially Strawberry, Doc Gooden, HoJo and of course Gary Carter. 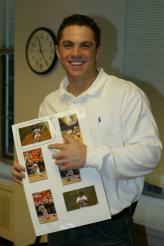 Look for David Wright autographed cards in Topps/Bowman products throughout the 2005 season.